Judges for the AHC’s “Name the Tribble” Contest. The tribble, delighted to have a name that distinguishes it from the thousands of other tribbles in existence, appears in party attire. 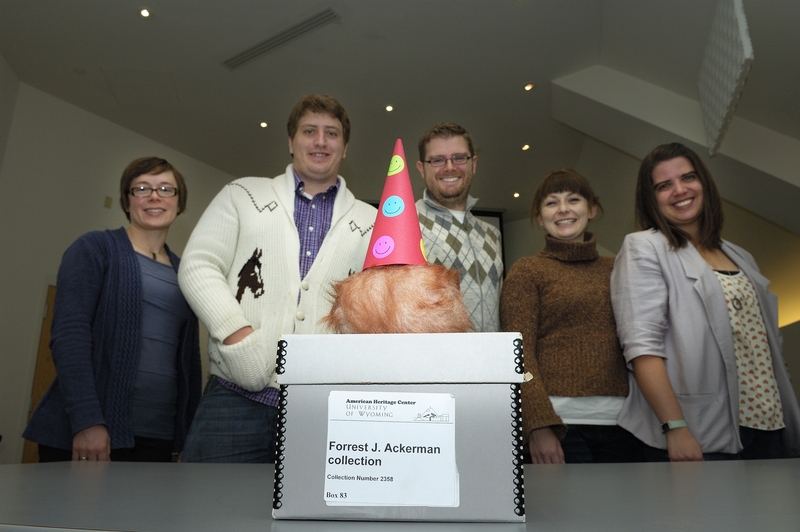 Since the tribble is a part of the Forrest J. Ackerman collection at the American Heritage Center, one of the most clever and collection-specific submissions for the contest was “Furry Ackerman.” Congratulations to Edwin Bode and Tom Lenahan, who each suggested this name. But hold on! We have other winners that we would like to acknowledge as well! “Roddenhairy” appealed to the judges because it was the most “Star Trek-ey” (after Gene Roddenberry). Congratulations to Yvonne Parker, who submitted this entry. “Alotta” seemed to embody the tribbles’ ability to reproduce quickly–thank you to Patrica Lenhart, who suggested this name! Another name that conveyed another tribble-esque quality was “Serena,” reflecting the tribbles’ soothing affects on humans. Thank you to Bernadette Benz for suggesting this name! And finally, because this is a tribble that now lives in Wyoming, “Wyomble” appealed to the judges’ sense of place. Thank you to Caroline McCracken-Flesher for providing the tribble with such an inventive nickname! Some other extremely popular names that were suggested include Trouble, Tumbleweed (the tribble does resemble this common Wyoming sight! ), Harry, Gizmo, Coo, Elbbirt (“tribble” spelled backwards), Ishkabibble, as well as Tiberius and several variations–such as Triberius or T. Tiberius Tribble. We would like to thank everyone who suggested a name; the judges enjoyed reviewing all of the entries–we received 454 entries in total! Thank you for your enthusiasm and creativity. Your participation helped make this American Archives Month activity a clear-cut success! The Archives Month excitement doesn’t have to end here, though–you are always welcome to visit the American Heritage Center on the University of Wyoming campus to see what other interesting things we have in our 80,000 cubic feet of collection material. That’s history, right there! 2 Responses to Meet Furry Ackerman! wow, thanks! put me in touch with tom lenahan! You do know that the Tribble episode came from a chapter in Robt. Anson Heinlein’s novel “The Rolling Stones”, right? As an aside, another name could have been “Wyoming Knott” who was a heroine of RAH’s “The Moon is a Harsh Mistress” which also had a character who was a grandmother of Castor and Pollux Stone (heroes of the other novel). RAH was a genius in tieing his “Future History” together. Too bad Star Trek didn’t acknowledge the genesis of that episode — Gerrold’s writing style is Heinleinesque.